As the center of both daily life and special occasions, the kitchen should be every homeowner’s favorite room! Optimum Construction can help you get the style you want for your kitchen remodel, whether you want a completely new kitchen design or to spruce up your layout with new, custom cabinets and countertops. Our client-focused kitchen contractors in Potomac, Rockville, and the neighboring communities have the expertise and talent to ensure a smooth and successful kitchen remodeling project. Get in touch with our Maryland kitchen remodeling team today or call (240) 422-9990 to get started! Kitchen trends may come and go, but great kitchen design is built to last. Our kitchen remodeling team can create a new look and feel that will be enjoyed for many years to come. Whether you want to make quality meals at home or turn the space into a comfortable hangout for kids and guests, Optimum Construction can make it happen. To schedule a kitchen remodel near you in Maryland, Northern Virginia, or Washington, DC, call (240) 422-9990! Custom Cabinets, Countertops & More! Kitchen work requires expertise in plumbing, electrical, carpentry, and more. When you choose Optimum Construction, you get master craftspersons in each discipline, plus leadership to steer the project successfully! 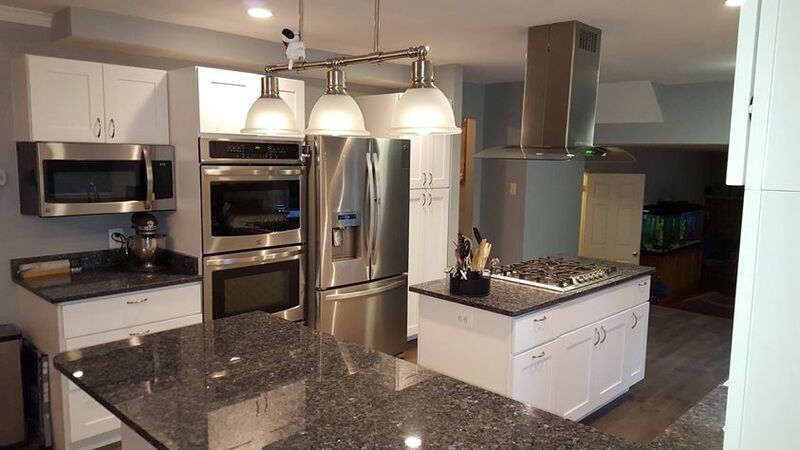 Read about our customer experiences or take a look at the recent kitchen remodeling projects completed in our gallery to get a feel for the quality of our work. For your project, we do everything it takes to make you 100 percent satisfied with the results. Whenever we remodel a kitchen in Maryland, we start with an onsite consultation to learn about your vision, goals, expectations, budget, schedule, and more. As we begin work and until the final day of clean-up, we welcome your participation in the project. Are you looking to design the perfect kitchen remodel in Bethesda, Potomac, or nearby? Call Optimum Construction at (240) 422-9990! For such an important home improvement project as kitchen remodeling, your choice of contractor is of the utmost importance. At Optimum Construction, we deliver the results you want thanks to our client-centered approach, the quality of our construction team, and our management team’s deep experience in the field. Since 2008, we’ve been serving the DC metro area including Rockville, Potomac, Bethesda, and beyond. As a full-service home construction company, we are up to the task of any small or large kitchen remodeling project. Planning a kitchen remodel starts with a conversation. Our project managers and estimators will be happy to discuss your ideas in a personalized consultation. We provide kitchen remodeling and more home construction services in Montgomery County and the greater DC metro area. Call us at (240) 422-9990 or schedule a consultation online.